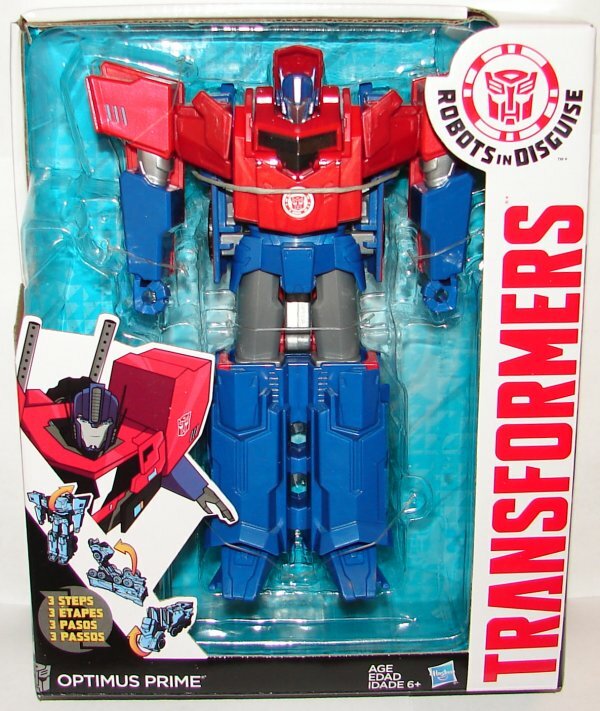 I’m not at all sold on RID, but it must be said, the line has some great Optimus Prime toys. As I write this it’s just a couple hours until the USA premiere of RID. Hopefully I will feel better about it after the premiere. 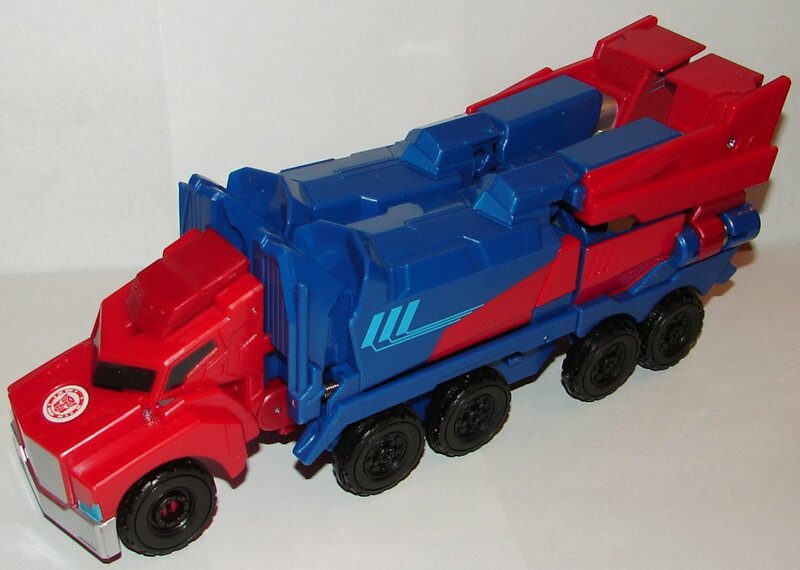 Aside from seeming to take more than three steps to transform, this is a pretty great Optimus Prime toy. I love the integrated trailer, and he has an excellent head sculpt. He’s doesn’t have a lot of paint apps, but he has enough to make him look good. Could use a few on his legs in robot mode. As a Three Step Changer he’s a pretty good sized toy. I’m still upset that there is no Voyager or Leader Class toys for RID. There are a couple of larger Optimus Prime and Bumblebee toys coming, but one is a One Step Changer, and the other is a Three Step Changer. Can’t recall which is which. Still this design needs a really nice leader class toy. 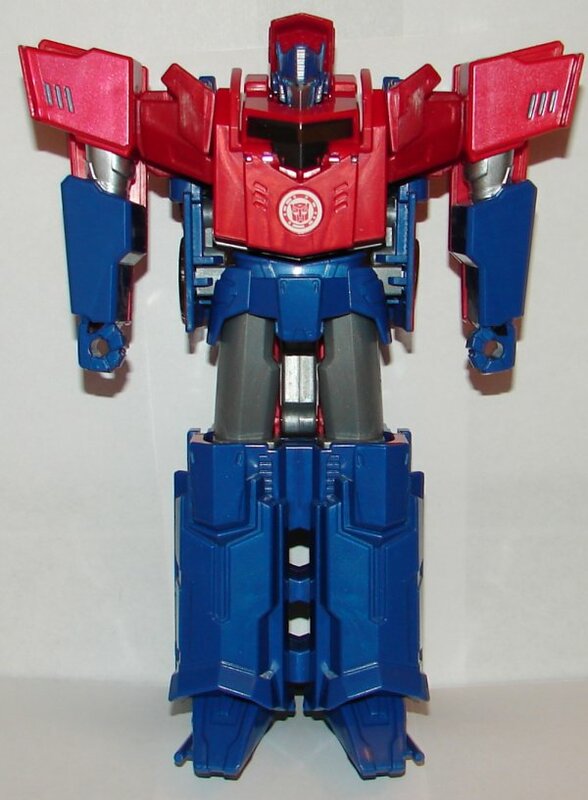 This entry was posted in Toy Reviews, Toys, Transformers and tagged 3 Step Changer, Optimus Prime, RID, Robots in Disguise, Three Step Changer, Toys, Transformers, Transformers: Robots in Disguise. Bookmark the permalink. I kind of agree on Rescue Bots, we could do with a few less, especially the oddballs (giant horribly designed Dino Prime for example). We need all the original modes for the four mains in the new scale instead of just their new modes. As to RID, having now seen the pilot, it’s pretty clear Prime is not as dead as we thought. In any case, I don’t mind the Prime toys in as he’s my favorite character. Honestly, I’m hoping Megatron gets resurrected toward the end of season one. It’s just not right without him. It’s like all the Bumblebee and Prime toys for Rescue Bots – they are only occasional visitors, but they are favorite characters and everywhere in the toys. In the new RiD, OP is said to be dead, but there are more of his toys than even Bumblebee, who is the lead in this show. We get hints that Prime’s death may be exaggerated, but I wouldn’t expect much more information until much later for the end-of-season (or mid-season break) change-up, and I’d expect him to disappear again just as quickly. This show is about BB, after all. Too bad Rescue Bots is too kid-friendly. We probably won’t see Prime bite it – maybe killed and reformatted by Dr. Morocco into Nemesis Prime or Motormaster – as a precursor to RiD. Hey, six-year-olds! 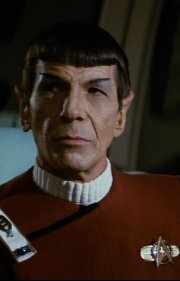 Here’s your hero – murdered by a human – and you aren’t going to find out otherwise until another TV series! Unlike G1S3, they can’t bring him back, because it would mess up another show’s canon!